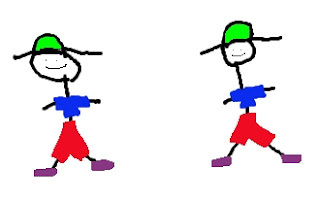 So here we have two stickmen that I just drew with my nifty drawing tablet. Note how similar they are. They both have red pants and blue shirts and green hats and purple shoes. Why are they so similar? Because I designed them that way. How can you know that? Because I drew them. They don't reproduce, and the similarity is too striking to be random. The only way they can possibly be that similar is if they were designed to be similar. So far, so good? 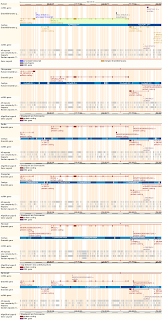 OK, now here's a swatch from human and primate genomes that I grabbed from Ensembl. It's the breast cancer BRCA2 gene. Now click on it so you can see the details. This diagram represents a linear segment of DNA. The species are labeled on the left, and at the top, you should see a mustard yellow line of boxes highlighted in light green and marked "BRCA2." That's the human BRCA2 gene. As you look down at different species (chimp, gorilla, etc. 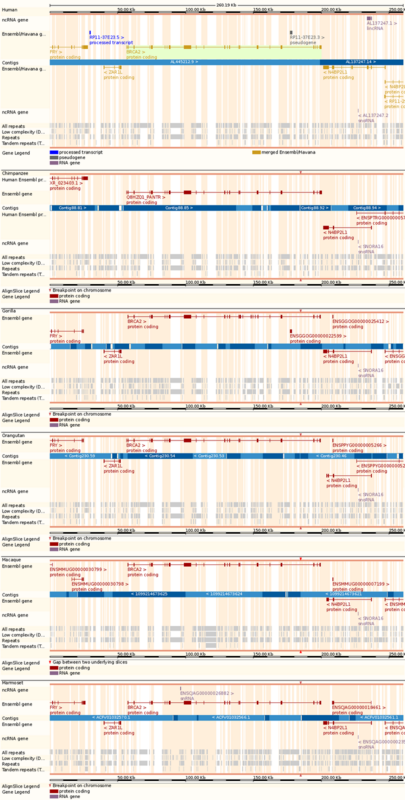 ), you'll see that ever species has a BRCA2 gene (represented by dark red boxes), and they're nicely lined up. The key parts I want you to see are the lines of boxes marked "Repeats." They're sort of grayish at the bottom of each row. Each little gray box represents some kind of repetitive sequence (like a transposable element) in the DNA. Notice how the apes have pretty much the same grey boxes in the same place as the human does. You could choose pretty much any region on an autosome (a chromosome that's not an X or Y chromosome), and you'll get the same basic diagram. The gray boxes representing the repetitive elements will be the same in apes and humans. How does this happen? Is it random? No, we can totally rule out random similarity. Statistically speaking, it's essentially zero probability that this could be random. Could it be somehow functionally necessary that these repeats be the same? That's unlikely, because some of these repeats are naturally variable and you would never even notice. So you could change them, and nothing would happen. Could it be inheritance from a common ancestor? That's at least a logical possibility. A creationist has to rule that out, though, because the Bible says that God created humans separately from apes. And that is why this similarity has to be the result of design. We know that God created apes and humans separately. The similarities they share must by necessity be a result of that creation even. Just like the stickmen are similar because I drew them that way, so too the repetitive elements in the human and ape genomes are similar because God made them that way. The question remains: Why? I made my stickmen similar because I could. I just picked some colors because I wanted to. Other than illustrating similarity, there was no logic to my choices. I don't think that's the case with God's creation. God is very intentional, and He acts according to His nature. That means there is a reason behind the similarity. Some of you get this and have been waiting for me or some creationist to finally explain why. Enough with the stickman drawings already! I hear your frustation, and I'm going to be sinking my teeth into the question of similarity in the next few months. Stay tuned.